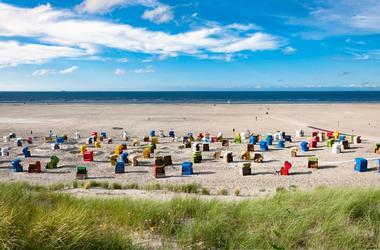 There’s really no need to leave Germany in search of an idyllic beach vacation. It may not be the stereotypical tropical paradise that most discerning beachgoers long for, but Germany is not lacking in sugar sand beaches, exhilarating water sports, or coastal comforts. Eckernforde Haupstrand is a four-kilometer-long, white sand beach that is located in the coastal town of Eckernforde, Germany. The beach overlooks the Eckernforde Bay, filled with the deep blue waters from the Baltic Sea. There’s a large variety of stalls, shops, and restaurants within a short walking distance of this pristine beach. This is the perfect place to unwind with the family for a whole day, with a basketball court, trampolines, and playground available for the kids. 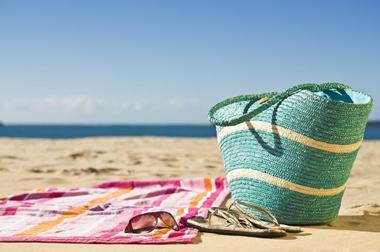 The beach is also equipped with volleyball courts, beach chairs and beds, and a spacious, renovated promenade. 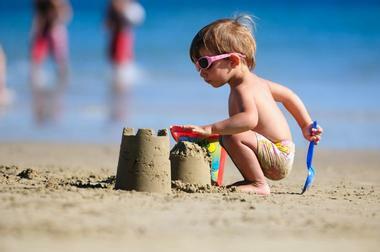 The beach is popular for a number of water sports, such as scuba diving, sailing, windsurfing, and kitesurfing. Familienlagune Perlebucht is a gorgeous beach that leaves little to be desired. It’s located in the northwestern part of Germany, in the coastal town of Busum on an artificial island that offers the most idyllic conditions for the perfect beach day. This modern and renovated beach is situated along the North Sea, offering visitors pools of water that are uninfluenced by high or low tides. Visitors will have a large number water activities to enjoy, such as windsurfing, kitesurfing, swimming, surfing, and scuba diving. 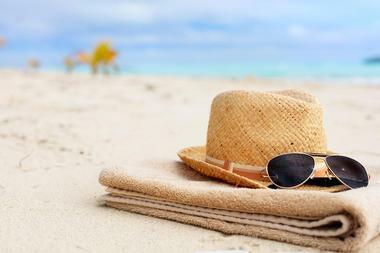 The beach is also equipped with a variety of picnic areas, barbecue's, and beach chairs; as well as soccer fields and volleyball courts. Hornum Oststrand is a sprawling beach that is located on the German island of Sylt, an island that is situated just off of the nation’s northwest coast. The beach is nestled at the very southern end of the island, offering an idyllic retreat from the rest of Sylt’s trendy beaches. The soft sands gradually make their way into the shallow waters of the Wadden Sea. This eastward facing beach is relatively protected from the higher winds found on the west side of the island, making it the perfect location for beginner windsurfers to get their feet wet. Hornum is equipped with beach volleyball courts, as well as a billiards and mini-golf course at the nearby Creperie restaurant. Juister Stand is a North Sea beach that is located on the scenic German island of Juist. The beach can only be reached by plane or ferry, making it quite difficult to get to. Visitors will want to plan their trip to Juister Strand carefully, especially when considering how rare ferry rides to the island are. Once visitors make their way to the island, they’ll be treated to long stretches of untouched and mostly deserted beach. Visitors will more than likely see many more seals and different species of birds, than other beachgoers. There are also kitesurfing schools, playgrounds, beach volleyball courts, and several collections of beach chairs. Niendorfer Strand is an inviting, two-kilometer-long section of beach that is part of Timmendorf Beach, situated along the Lubeck Bay in North Germany. 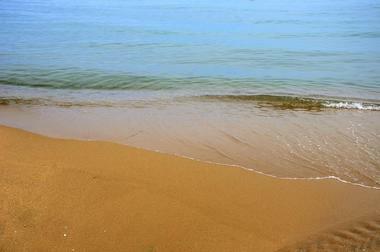 Niendorfer is a wonderful beach to escape to and relax with the entire family on a warm summer day. Visitors can unwind on one of the beach chairs, digging their toes into the light, cool sand as they listen to the hypnotic sounds of the waves crashing against the shore. Along the beachfront, visitors will find several restaurants and small cafés to choose from – should hunger strike. There are also plenty of fun and exciting watersports for beachgoers to enjoy, such as surfing, stand-up paddleboarding, and windsurfing. Norderney Nordbadestrand is a beige-sand beach that is located on the East Frisian Island of Nordernrey, situated along the island’s north shore. Visitors will find two sensational restaurants located right on the beach, plenty of space for beach soccer and volleyball, and an observation deck. Families traveling with children will definitely appreciate the nearby playground, bungee trampoline, and the miniature golf course that overlooks scenic sand dunes. The beach is also equipped with restrooms, showers, and plenty of beach chairs. With easy access to water sports that include surfing, kitesurfing, and windsurfing, beachgoers will have plenty to keep them entertained throughout the day. Nordseestrand Neuharlingersiel is a beautiful beach in northwest Germany that offers visitors the very best of two different worlds – action and relaxation. On one side of this pristine beach, visitors will find a number of kite surfers and windsurfers gearing up to hit the waves; on the other side they’ll find plenty of beachgoers unwinding in beach chairs with their toes dug into the cool sand. Visitors will have a plethora of land activities to choose from, such as basketball, beach volleyball, and football. The beach is also equipped with a charming bar that offers a large variety of food and beverages, it’s complete with beanbags, chairs, and other furniture. 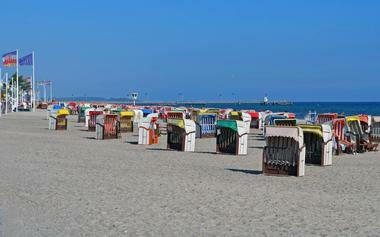 Osteesbad Binz is a four-kilometer-long beach that is located in the German resort town of Binz, Germany. The sprawling beach faces east on the German island of Rugen, offering visitors plenty of opportunities to catch magnificently-colorful sunrises. There’s a long, picturesque promenade that runs along the beach, providing several small shops, boutiques, cafés, and restaurants for beachgoers to explore. There are wooden footbridges that have been numbered that lead from the promenade’s grounds over the dunes to the main sections of beach. 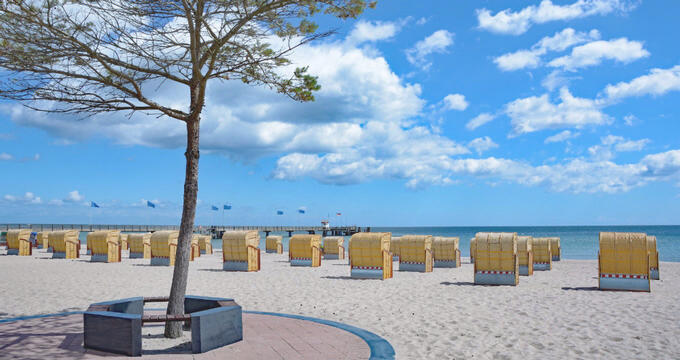 Ostseebad Binz is also equipped with premier surfing and sailing schools, as well as a plethora of beach chairs for rent. Ostseebad Dahme is a pristine, sandy beach with clean, shallow waters that is located in the small resort town of Dahme, Germany, along the Baltic Sea. The beach brings in droves of tourists and holidaymakers each year, providing them with an idyllic setting with which to relax. Water sports are a big reason people flock to this soft sand beach, with catamaran sailing, surfing, stand-up paddleboarding, kitesurfing, and windsurfing all available, visitors will have plenty to keep them entertained throughout the day. There’s a bustling promenade that is equal in length to the beach, equipped with bars, bistros, small cafés, restaurants, boutiques, and ice-cream parlors. Visitors can also enjoy the playgrounds, trampolines, and miniature golf. Ostseebad Prerow is a picturesque, eight-kilometer-long, sandy beach that is located in the seaside resort municipality of Prerow, Germany. This sprawling, white sand beach provides a dreamlike setting for all who visit. 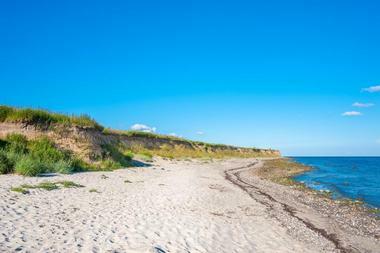 Situated along the Baltic Sea, the beach really delivers a paradisal ambience. The western portion of the beach features a quieter, more natural setting; while the beach’s center lures visitors with its plethora of comfortable beach chairs. The notoriously famous Weststrand section of beach has scenic footpaths and cycling paths winding through lush-green forests along the bright white sand. 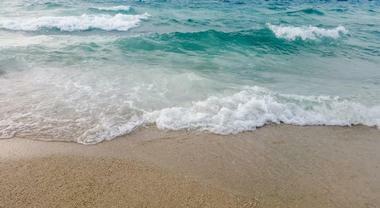 Deep blue waters beckon beachgoers for kitesurfing, windsurfing, and relaxing swims. Ostseebad Strande is an idyllic holiday resort that is situated along the Baltic Sea, within the German municipality of Strande. 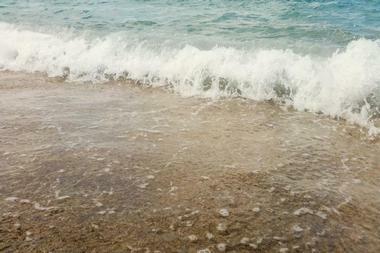 The resort and its pristine beaches offer the perfect escape for those seeking a tranquil experience. 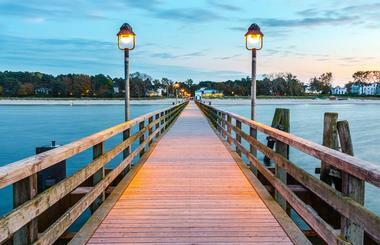 This small, seaside village features a beautiful promenade that leads visitors to cozy restaurants and cafés. Visitors will appreciate the uncrowded beaches, giving them the opportunity to relax in solitude, overlooking the waters of Eckernforder Bay. A large marina borders the beach, so beachgoers will see plenty of sailboats and yachts passing by during high season. Ostseebad Strande also delivers excellent conditions for kitesurfing and windsurfing. 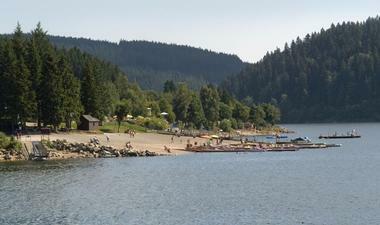 Schluchsee is a charming, lakefront town that is located in Beisgau-Hochschwarzwald, a county in southwest Germany. 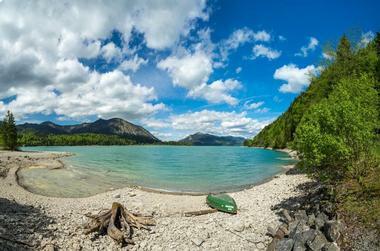 Schluchsee is a beautiful reservoir lake that is surrounded by lush-green forests and rolling hills. Visitors will have miles and miles of idyllic beachfront space around the lake to choose from. 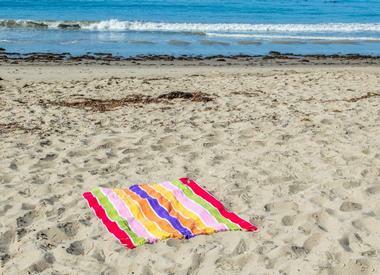 They’ll be able to set up shop for the day with a few towels and blankets, beach chairs, and a picnic basket. 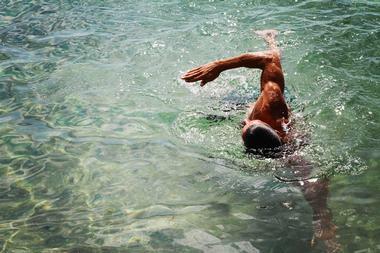 The water is crystal clear and very clean, perfect for enjoying relaxing swims, or any number of water sports. Visitors will find that the beaches around the lake connect to several scenic hiking and biking trails, giving them a wonderful opportunity to connect deeper with nature. Schonberger Strand is a beautiful, sandy beach that is located in the seaside town of Schonberg, Germany. This magnificent beach features light-colored sand, rolling dunes, a plethora of beach chairs, and a long pier. 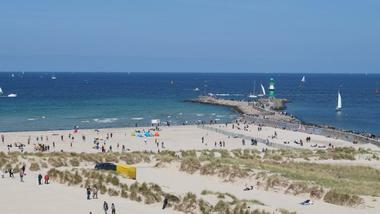 The beach stretches over seven kilometers in length along the shimmering Baltic Sea and Bay of Kiel. This very long and famous beach has been divided into many different areas. 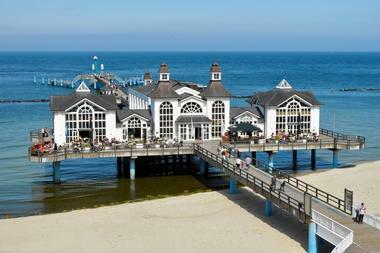 The pier is 260 meters long, providing its visitors with stunning views over the beach, dyke, promenade, and Baltic Sea. Beachgoers will have a variety of fun water sports to enjoy during the summers, such as windsurfing, kitesurfing, kayaking, and stand-up paddleboarding. Situated along Germany’s northeast coast, on the Bay of Greifswald, Seebad Lubmin is a five-kilometer-long beach that is located in the seaside municipality of Lubmin. 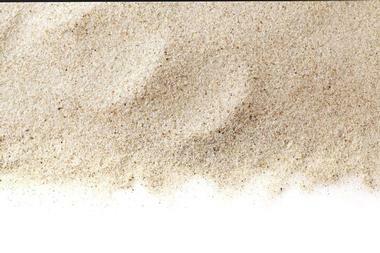 This fine-sand beach can easily be reached by car, public transportation, or a short walk from the resort town’s center. 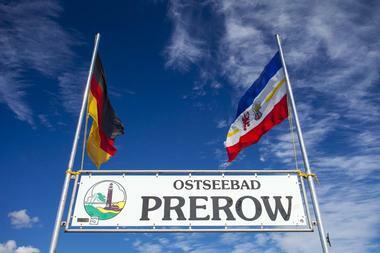 Seebad Lubmin provides the perfect destination for family fun, relaxation, water sports, and plenty of nature. On the eastern end of the beach, near Marina Lubmin, visitors will find perfect conditions for kiting, surfing, and sailing. There are plenty of bars and cafés along the beach for visitors to grab a quick drink, or bite to eat. The beach is surrounded by lush pine forests, rosehip bushes, and sea buckthorn bushes. 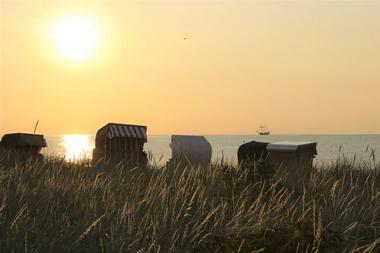 Stage 16, or Buhne 16, is the beach that put the German island of Sylt on the map as a popular holiday destination. Stage 16 has long history of being one of Europe’s favorited nudist beaches, throwing extravagant parties, and being the birthplace of German surf culture. Throughout the 1960s and 70s, the beach was a major hotspot for the rich and the famous. There are wooden footbridges that meander their way through the nature preserve’s rolling sand dunes. They lead to places like the notorious beach bar and restaurant Buhne 16,where visitors can enjoy fresh North Sea catches, pizza, and champagne. With its rich history and perfect waves, Stage 16 is a surfers’ paradise. Strand Timmendorf-Poel is a popular beach that is located on the German island of Poel, within the Baltic Sea. The island forms the natural eastern and northern barriers of the Bay of Wismar, along Germany’s northeast coast. With everything from rope climbing to windsurfing to kitesurfing, visitors will find plenty of activities around the beach to keep them entertained. Visitors will have the opportunity to rent beach chairs, canoes, stand-up paddleboards, and a plethora of other beach supplies and water sports equipment. Strand Timmendorf-Poel is also equipped with a climbing construct for kids to play on, as well as beach volleyball courts. The beach is surrounded by a variety of sensational restaurants and snack bars. Strand Warnemunde is a white sandy beach that is situated along the Baltic Sea in northeast Germany. It is located within the German port town of Warnemunde in Rostock. 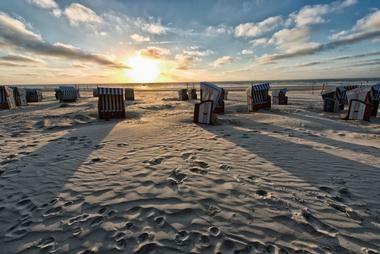 This beach is a popular destination among German tourists and locals during the summer months. The beach is equipped with everything from playgrounds for children to surf schools for those looking to pick up a new hobby. There’s a beautiful promenade where visitors will find numerous fish stalls, shopping boutiques, and restaurants. To add a little excitement to the holiday, there are plenty of operators along the beach where visitors will be able to rent equipment for kitesurfing, windsurfing, and stand-up paddleboarding. Sudstrand Burgtiefe is a sprawling beach that offers soft, white sand and clear waters on the beautiful German island Fehmarn. Families, couples, and solo travelers will feel like they’ve carved out a little slice paradise for themselves the moment they dig their feet into the sand for the first time. There’s a lifeguard on duty that monitors bathers during the beach’s high season, making it a popular choice for those traveling with children. There’s a small promenade where visitors will find stalls selling delicious cheese curds with berries, or fresh fish sandwiches, situated right along the beach. Visitors will also have easy access to water activities that include stand-up paddleboarding and pedal boating. Sudstrand Pelzerhaken is a fine, beige-sand beach that gets water-sports enthusiasts’ hearts racing when they see it for the first time. Located in the German municipality of Pelzerhaken, the long, dune-lined beach provides the ideal conditions for kitesurfing and windsurfing. The beach is equipped with two local kitesurfing and windsurfing schools, for anyone looking to add a little excitement to their vacation. Stand-up paddleboarding and sailing are also extraordinarily popular water activities here. This stunning beach provides the perfect escape for any family, with plenty of programs available for children, and pampering opportunities available for parents and discerning adults. 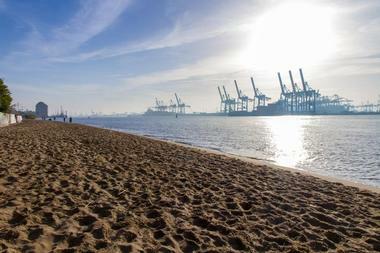 The Elbstrand is a scenic beach that is located along the winding Elbe River in Hamburg, Germany. In one area of the beach, visitors will find the Wittenberger Shore, an idyllic setting that guarantees a relaxing getaway. 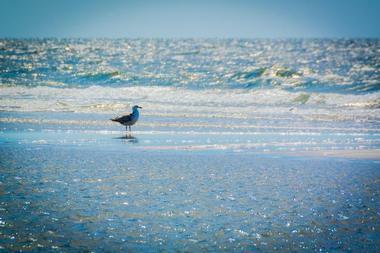 Couples, families, and groups of friends flock to this soft-sand beach during the summers, especially on the weekends. There’s a towering and impressive, red and white lighthouse that is situated on the shores of the river, a local landmark for visitors to admire. As visitors relax on the beach, they’ll enjoy the relaxing sound of seagulls in the distance, and stunning views over the shimmering Elbe River. Themenstrand Scharbeutz is a lively and colorful beach that is situated along the shimmering Lubeck Bay in Scharbeutz, Germany. This white sandy beach beckons visitors to relax in anyone of the numerous beach chairs that line its picturesque shores. On top of the plethora of bathing areas, including shallow-water areas that are perfect for children, there are sections of beach for dogs, barbequing, and watersports – even nudist areas. There are several restaurants and cafés that are located along the curved promenade, providing visitors with easy access to food and drink during their time at the beach. Visitors can hit the inviting waters for a little scuba diving, surfing, or stand-up paddleboarding. 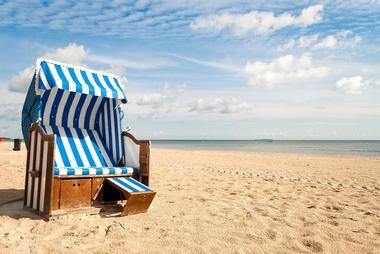 Ostseebad Binz is a beautiful sandy beach that is over four kilometers long, located on the German island of Rugen. The beach has been broken in to several different sections that cater to specific desires, like a seamless tan, playing with a dog, or getting geared up for some exciting watersports. There are usually a number of beach activities being enjoyed by visitors, such as beach tennis, soccer, and volleyball, as well as Frisbee. For those hitting the water, they’ll have the opportunity to partake in sailing, surfing, paddleboarding, and banana boat rides. All along the promenade, visitors will find sensational cafés and restaurants. Walchensee, also known as Lake Walchen, is a picturesque lake that is nestled between the Herzogstand Mountains and the peaks of Hiemgarten. The lake is surrounded by lush-green forests, and rolling hills, offering scenic views in nearly every direction. There are spectacular little sections of beach that can be found all around the lake. The clear, turquoise and blue waters of the lake beckon beachgoers for relaxing swims, windsurfing, sailing, paddleboarding, and kayaking. The lake draws a large number of scuba divers, due to its crystal clear waters. Visitors can also enjoy scenic walks along the lake’s shores, while sipping on an ice cold Bavarian beer. Westerland Haupstrand is the main beach that is located on the Frisian island of Sylt, just off of Germany’s north coast and Denmark’s southern coast. Bars, cafés, restaurants, and nightclubs are all within a short walking distance of the beach. 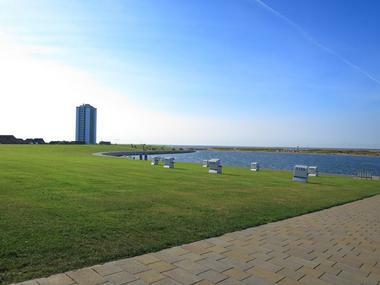 There’s a large promenade that features numerous stands that offer souvenirs, clothing, and fresh North Sea catches. There are many food stalls along the beach that serve crepes, fish rolls, and other local delicacies for something quick to eat. Westerland also happens to be the island’s watersports mecca, boasting everything from surfing to kitesurfing to parasailing to windsurfing. Visitors and locals alike are often seen gathered around the beach’s popular music shell. Wulfener Hals is a 1.5-kilometer-long beach that has a unique shape that’s been divided into two separate sections. This sprawling beach is situated on the beautiful German island of Fehmarn, offering visitors a wonderfully-scenic and relaxing escape. The beach features a shallow water entrance that is perfect for children bathing, or for individuals with disabilities that require assistance when entering the water. There are numerous water sports available for beachgoers to enjoy, such as sailing, stand-up paddleboarding, surfing, and windsurfing. The beach is also home to a five-star campsite that is open year-round. It’s equipped with clean bathroom facilities, a sauna, and heated pool.